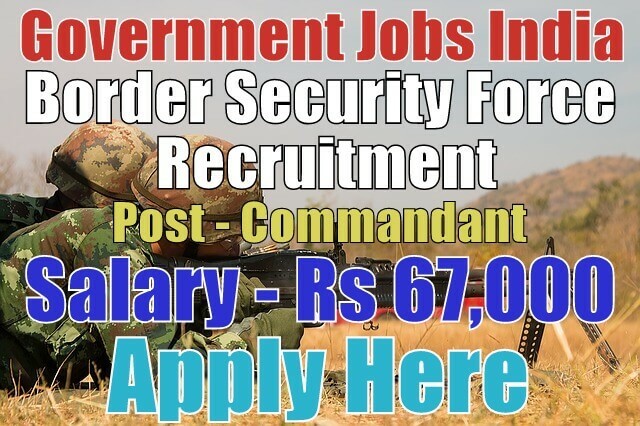 Border Security Force BSF recruitment 2017-18 (Ministry of Home Affairs) notification for 02 commandant posts. All legible and interested candidates can apply on or before (19-07-2017). 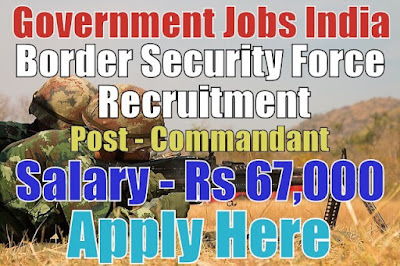 Further information about the Border Security Force Bharti online form and exams, vacancies, salary details, BSF jobs, application fee, educational qualifications and all other details/information about this post is mentioned in details below. 2. Commandant (Arch) - 01. Salary/Pay and Grade Pay - For commandant (works and arch) posts, the payable salary will be Rs 37,400 - 67,000 with Rs 8,700 grade pay. Further information about salary details is mentioned in the detailed advertisement. Educational Qualifications - Candidates have must done 10th (matriculation), 12th, a graduate degree or it's equivalent/relevant/higher qualification from a recognized board or university. To know more about educational qualification details, see the advertisement. If you are not graduated then, click here for 10th and 12th based jobs. Work Experience - Candidates must have 15 years of work experience in execution of civil works and architecture. For more information about work experience required for these posts, go through the detailed advertisement.